Seriously, they do horrible things to dogs behind the race tracks. You'll hear the breeders say things like, "greyhounds like to run," and ,"wee treat our dogs humanely." Well, all dogs like to run. No dog likes to be forced to run in the blistering sun while wearing a muzzle (meaning it can't keep bugs and dust out of its nose.) And yes, I'm sure that the top racers are treated humanely. I'm more concerned with the dogs that don't perform well. The ones breeders cull from the pack the moment they start to slow down. Dog racing is not culture. It is not heritage. It is animal abuse. Plain and simple. You hit the nail on the head! It is sad, but true. Tens of thousands are still being culled each year cross country. Ther emay be more, but breeders do not register all of their puppies born. So, their is no way to get a true and accurate number of slaughter. The racing industry is running out of time and excuses. 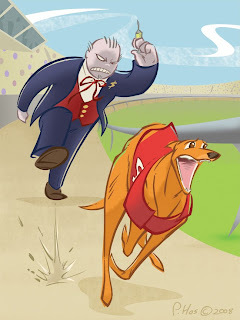 Thank goodness for blogs like yours and the expanse of social media, the exploitation of greyhound racing has become widely known. To further the end of greyhound racing, please consider getting involved and joining the ranks of thousands of people not afraid to be silenced. Please click on my name for more info.